I’m always on the lookout for interesting startups and young vendors and have been following Diasyst for a while. Looks like they’re hitting their stride as Piedmont Healthcare plans to implement their solution in both diabetes specialty and primary care clinics along with independent Piedmont-affiliated practices and the residency programs at Piedmont Columbus Regional. Diasyst uses a patient-facing app to gather blood glucose readings and other information, then analyzes the data against best practices and current clinical guidelines. Clinicians can use an intuitive dashboard to make adjustments to patient treatment regimens and communicate those treatment plans directly to the patients, who can review them and indicate acceptance. I had a chance to see a demo a while ago. The screens are intuitive and the data is backed by research collaboration with institutions like Emory University, Georgia Tech, Grady Memorial Hospital, and the Atlanta VA Medical Center. It’s a great way for physicians to leverage other members of the care team in managing diabetes. I also like that they’re not just engaging with physicians – they’re looking to work with employer-based clinics and payers as well. Although Mr. H and Jenn have weighed in on the Athenahealth acquisition, I haven’t had a chance to put in my two cents. I agree with the sentiment that it seems like the end of an era, especially since the company has been highly visible in its campaigns for disruption, although at times it feels like they were leading what surely had to be a bubble. It’s definitely causing some anxiety for clients. I had drinks with my favorite OB this week and they just switched to Athenahealth after some disastrous interactions with a previous vendor. They were hoping for stability, but now feel uncertain about what the changes might mean. Athenahealth has been doing a nice job transitioning from the “more disruption please” era to continue looking at important factors, such as physician burnout. They just released some new data from their research that showed that physicians feel well supported when they have effective communication and strong communication. Isolation is a predictor of burnout and is exacerbated by administrative burdens, time pressure, and limited referral options. As industry watchers, we miss Jonathan Bush and his antics (wrestling at MGMA and HIStalkapalooza at the New Orleans Rock’n’Bowl are two of my favorite memories), but seeing what happens next will surely hold our interest. Back to the story of the demise of my OB colleague’s relationship with her EHR vendor. They had been in negotiations for some time around some serious customer service and financial issues. The discussions stalled and the vendor issued an ultimatum that sounded like it was going to block access to their charts, leading to the decision to make a hasty switch. They’re still sorting through some data migration issues, but are at least up and running. I’ve seen the emails and notices from the vendor and the best way I can describe them is a cross between a high-pressure timeshare pitch and a blackmail letter, with a side note of pleading. Several emails conflicted each other and different company reps threatened different termination dates and processes while begging them to stay. I was embarrassed for our industry as I read them. We can do better, folks. 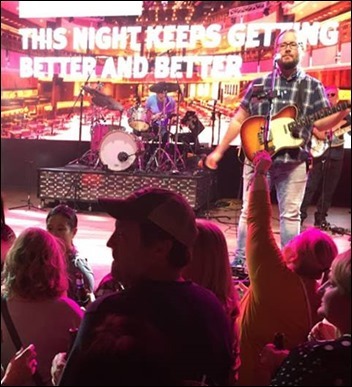 Speaking of doing better, NextGen Healthcare hosted its annual User Group Meeting in Nashville this week with the theme “Better Never Stops.” A reader shared this photo of CEO Rusty Frantz on the dance floor. I always joke that some year I’d like to hit the EHR vendor user group circuit, attending all the major get-togethers as part of a road trip to end all road trips. The budget for that adventure is beyond my reach, but I was more than happy to attend a regional summit hosted by Slalom in St. Louis along with partners AWS, Salesforce, and Tableau. For those of you who haven’t had the pleasure of visiting that Midwest city, you’re missing out on a delightful intersection of barbecue, hot chicken, and Italian food (including something called a toasted ravioli, which is a wonder by itself). Crashing with a med school colleague definitely left more room in the budget for culinary delights, along with the fact that the registration fee for the meeting was a requested donation to the United Way. It was a different kind of conference, focused on the goal of “reimagining healthcare for the local community” with afternoon breakout sessions where participants worked together to design solutions to problems like price transparency, managing complex care, and battling healthcare inequality. I enjoyed the hands-on approach and hearing directly from people in the trenches rather than being a passive listener. 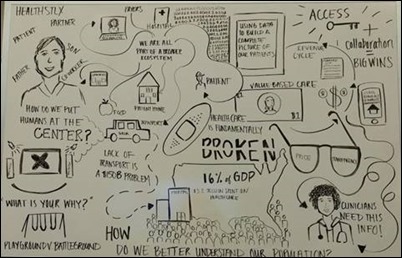 A white-board artist captured comments from a panel discussion as well as from keynote speaker Allison Massari, who spoke about an intense personal trauma and the value of compassion and connection as part of healthcare. My favorite quote was from a speaker who asked, “Is there a way to not essentially make the patient a victim in their own care?” Those are powerful words. The Slalom team did an excellent job pulling everything together and facilitating the breakouts. I may have to start checking out more regional conferences, especially those in cities where I can find a sofa to sleep on. At the conference, I also got to prep for HIMSS with some shoe watching. 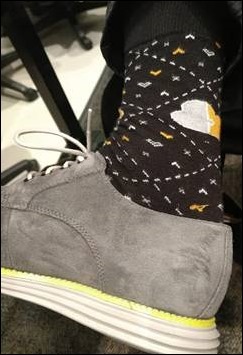 The AWS rep had snazzy trainers and company socks. One of the panelists had some seriously kicky boots, but I couldn’t figure out how to get a picture of them without being too obvious. I’ll have to practice my covert shoe capture skills before February rolls around. One of my intrepid readers noticed that I didn’t make my usual mention of Veterans Day in Monday’s Curbside Consult. It wasn’t an intentional slight, but rather an issue with my writing timeline ahead of some other commitments, including celebrating a family milestone with my favorite veterans. 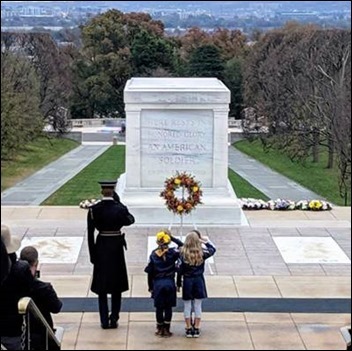 Many of my physician co-workers trained in the military and their wealth of experience is an ongoing reflection of the years they dedicated to protecting our nation.